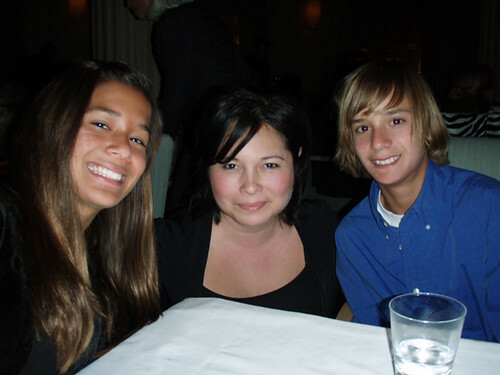 My niece Kindal and nephew Chace recently turned thirteen, which I think is the very first “milestone” birthday that most of us celebrate. At thirteen we’re “cool” teenagers… at sixteen we get to drive (if we’re lucky)… at eighteen we’re “grown-ups” (although I personally disagree with that one!). Turning twenty-one means cocktails, cheap Happy Hour food and getting a real job…. while thirty means we’re done making the stupid mistakes we made in our twenties (hopefully)! To celebrate the twins 13th birthday, I wanted to do something extra special with my sister’s amazing kids. They have never been on an airplane (except on a film set! 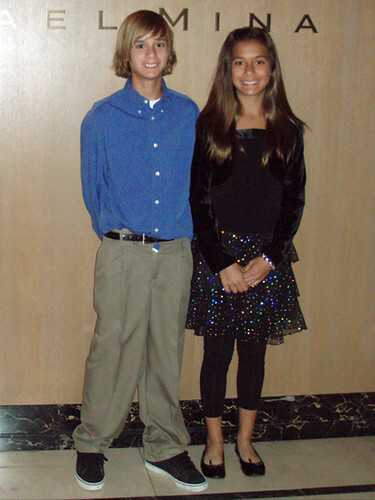 ), so I figured this was the perfect way to celebrate them becoming bona-fide teenagers. I first thought about a Las Vegas trip. That would work out well for me because of the long list of restaurants I want to try in “Sin City”. 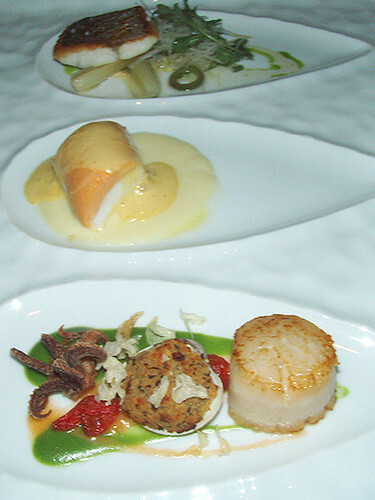 Places I’m dying to eat at are Jet Tila’s Wazuzu, the freshly flown in Mediterranean seafood at Bartolotta (both at the Wynn Encore), and the legendary Joel Robuchon at MGM. But the twins had been to Vegas before, during family boating trips to Lake Mead and I wanted this birthday celebration to be a whole, new experience. San Francisco sounded perfect. It’s a short flight (just over an hour) and we could fly out of Ontario airport (CA) which is near my sister’s house in San Dimas. I started checking flights online and noticed that the airplanes from Ontario to San Francisco were small (30 seat turboprop) commuter planes. For this, the twins first flying experience, I thought it would be better to board a large, roomy jet where they could do a little exploring in flight… meaning strolls to the back to check out the lavatories (remember, as a kid, when that was fun?). However, this route was more expensive (and a bit of a drive for my sister), but I went ahead and reserved flights from Los Angeles to San Francisco on January 24th. After I cleared the dates with my sister, and got my husband to agree to step away from his computer for two consecutive days, I booked the trip. Even though the twins thought the “gift” was going to be the airplane ride, I wanted to find a restaurant that would provide a wonderful memory for this special occasion. 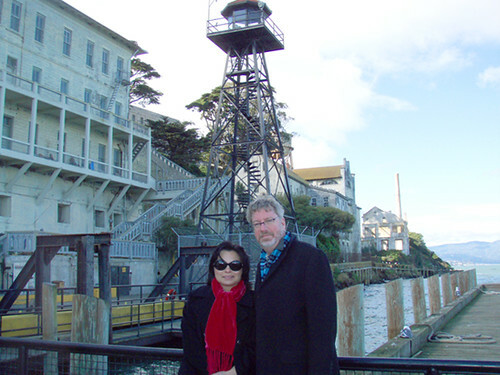 We had one night in San Francisco, and half of the next day for sightseeing. 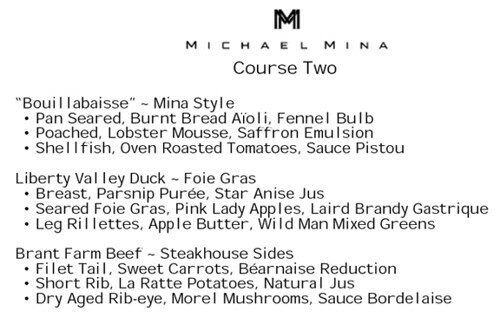 The only two restaurants that popped in my head were Hubert Keller’s “Fleur De Lys” and Michael Mina’s flagship restaurant “Michael Mina”. Both chefs had guest-starred on previous episodes of “Top Chef” (I’m obsessed with the show), so those were my top choices. 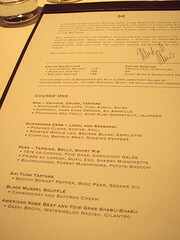 I started doing a little research on both restaurants and came across food blogger, KevinEats posting about his visit to Michael Mina in 2007. 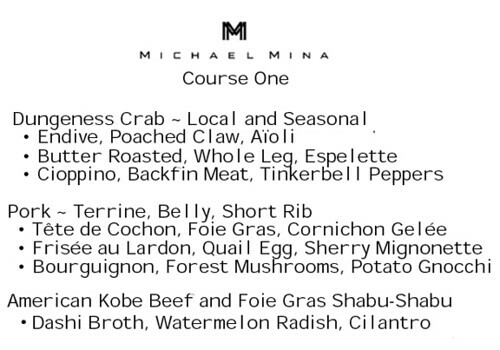 The pictures were incredible (his photos always make me drool) and after reading a few more recent reviews, I decided on the Michelin Two–Star Michael Mina. 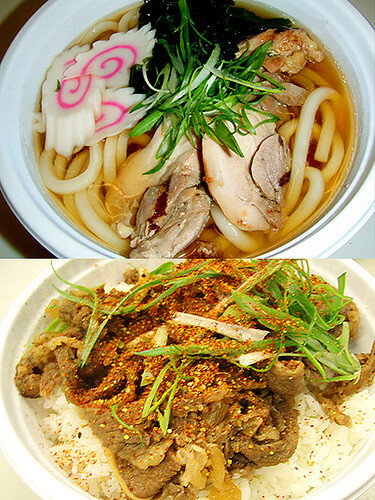 Flights booked… restaurant booked… now on to finding a hotel. 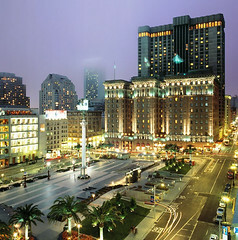 For years, my favorite San Francisco hotel had always been the Miyako hotel (now called Hotel Kabuki), which is located in Japan Town. 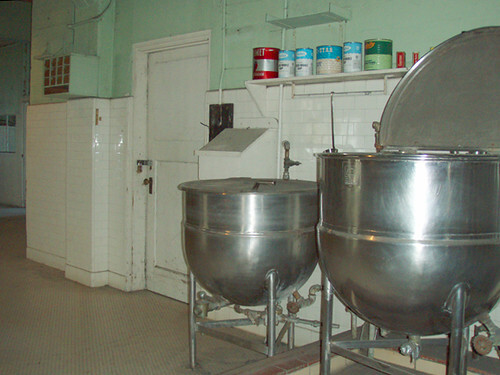 I used to love the deep, traditional Japanese bathtubs which always made me feel like I was back in Okinawa. In 1982, my sister was crowned “Nisei Week” Queen here in Los Angeles (a big deal in the local Japanese community). Luckily for me, I got to tag along with her to various Japanese events including the Cherry Blossom Festival in San Francisco. Hanging out with the “Queen” was cool. While she was busy with her official duties (being photographed with every business owner in J-Town), I was off (with a chaperone) eating my way through festival food stalls filled with Yakitori, Udon, Mochi and anything else in site. 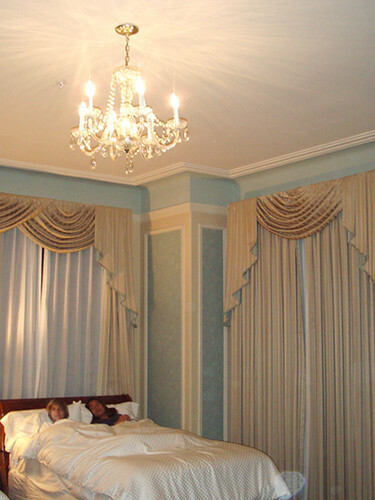 That was the first time I ever stayed at the Miyako hotel and for years after, it was the only choice… until now. When I read that Michael Mina restaurant is actually located inside the St. Francis hotel, I figured it was a “no brainer” to stay there just in case our incoming flight was delayed, and to also make sure the twins were comfortable. Driving around San Francisco can be a little scary at first, and rushing from hotel to restaurant, a few hours after their first flight experience, didn’t sound like fun at all. The St. Francis seemed the logical choice. Our flight left LAX at 12:50pm and I had the best time watching Kindal and Chace take in every moment. 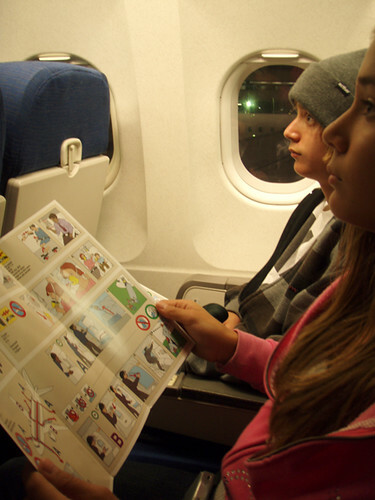 They listened carefully to every announcement, checked to make sure they each had their own”barf” bag, and actually read the emergency seatback cards. Just a week before our trip, Captain “Sully” had crash-landed on the Hudson River (everyone survived), so we were all a little more sensitive about the flight. Air travel has always been a huge part of my life, and I admit that I’m STILL excited when I board a plane, because it means I’m “going somewhere” (and hopefully it’s somewhere for fun!). 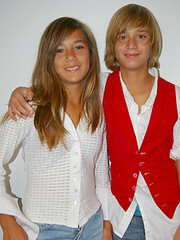 My sister and I had been flying since we were babies, when our dad was based in Okinawa. Those were incredibly long flights from Okinawa to California (with stops in Tokyo and Hawaii) during the Vietnam War. By the time I was three and Janet was six, we had crossed the Pacific Ocean multiple times to visit family in Los Angeles. That’s probably why this flight to San Francisco felt extra special to me, because I was taking my sister’s kids (who I love like my own) on their first official airplane ride. Thankfully, every step of the trip went as planned. 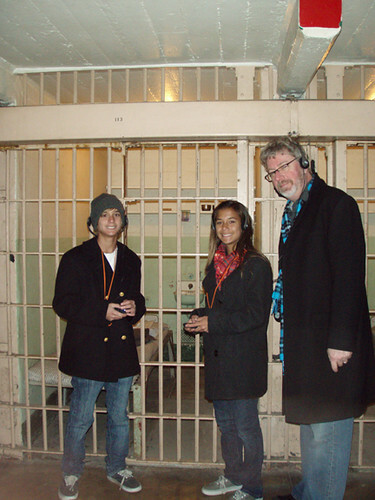 In less than 24 hours the twins had their first flight, their first Michelin star dinner (which was fantastic), a beautiful hotel room, and an incredible tour of Alcatraz. I wished we could have fit more in on this trip. We didn’t get to North Beach, China Town or my beloved J-Town, but we did exactly what I had hoped for in the first place… we made a whole new batch of unforgettable memories together! There were birthday cards waiting on the table for both Kindal & Chace (from the restaurant). 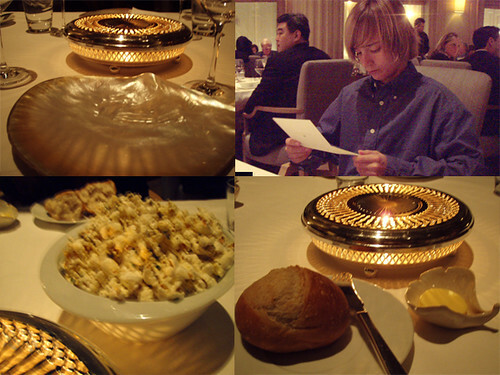 Bottom left (out of focus) is popcorn with shaved truffles. I was happily surprised that the twins loved it! 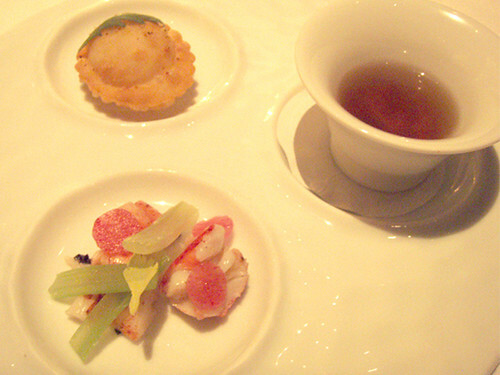 Trio of Lobster, the Amuse Bouche. 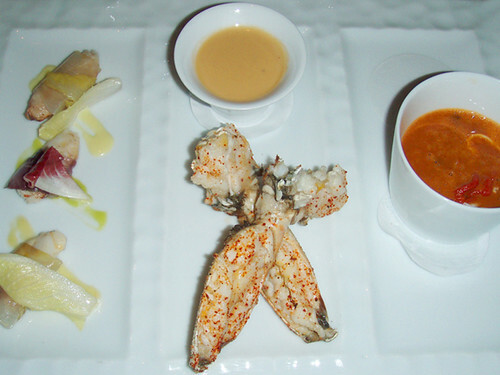 Trio of Dungeness Crab (my first course): Poached, Butter-Roasted and in Cioppino soup. 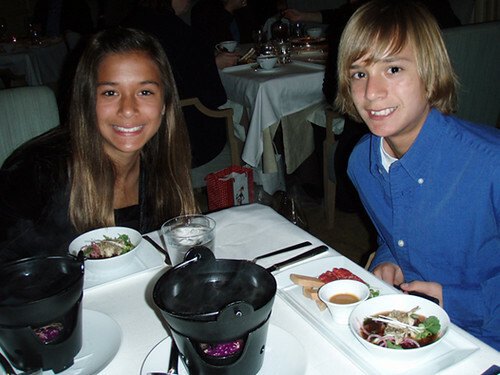 The twins both ordered the Kobe (Wagyu) Beef Shabu Shabu in Dashi Broth, with Foie Gras. 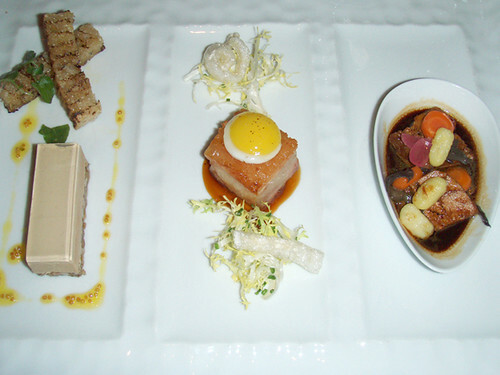 They didn’t like the Foie Gras, but I was proud that they both tried it! Peter and I happily ate it for them. 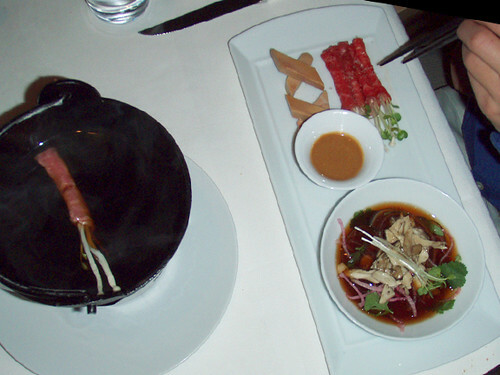 The Wagyu Beef Shabu-Shabu pot was a fun start to the evening. They both LOVED the exquisite beef of course! Peter’s second course: Bouillabaisse “Mina Style” with Barramundi, Scallop & Octopus. 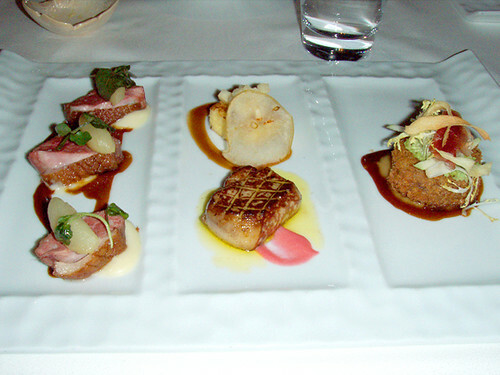 For my second course I had Liberty Duck “Three Ways”: Duck Breast with Parsnip Puree, Seared Foie Gras with Laird Brandy Gastrique, Duck Rillette Croquette with Apple Butter. ALL FANTASTIC. 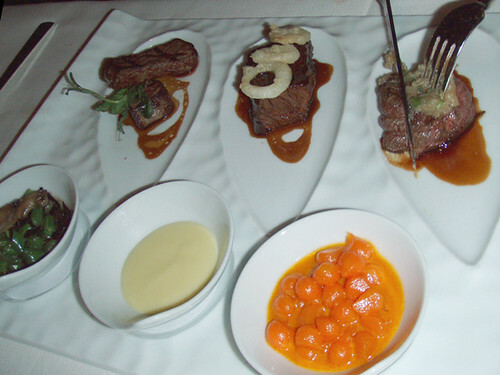 For their second course, the twins each selected Brandt Farm Beef “Three Ways”: Filet, Short Rib and Rib-Eye. I had a bite of the La Ratte Potatoes and they were the creamiest ever. 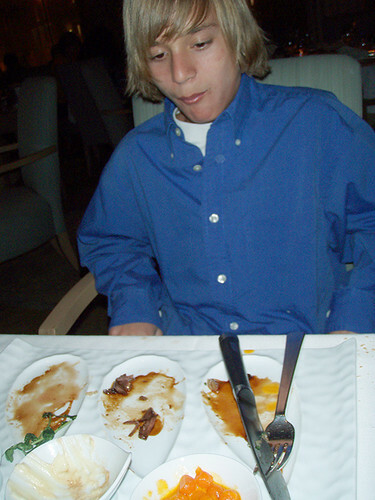 As you can see, Chace really loves his beef! 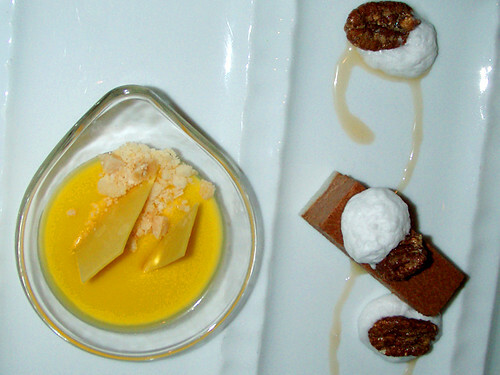 For the third course (dessert) Chace selected Panna Cotta with Passion Fruit, Chocolate & Banana. 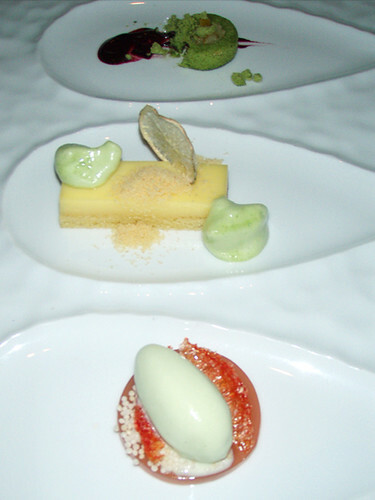 Peter had Meyer Lemon Marmalade, Lime Curd, Grapefruit Gelee and Tarragon Ice Cream. 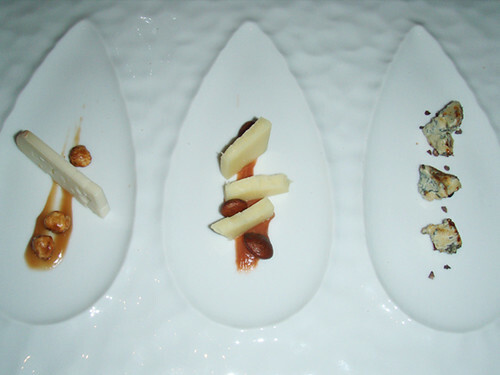 I went for the Cheese Course: Pata de Cabra, Pear Puree, Hazelnuts. Vermont Shepherd, Quince Puree, Marcona Almonds. Persille du Beaujolais, Cocoa nibs, Turbinado Sugar. Kindal had Tres Leches Cake with Guava and Cajeta Ice Cream. An extra treat at the end of dinner, was a personal happy birthday wish from the man himself! 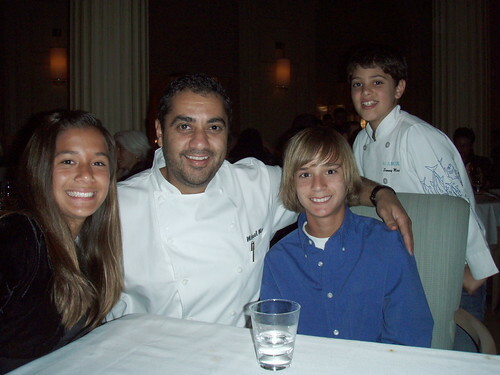 Chef Michael Mina and his adorable son, Sammy (who was working too!). Leaving the restaurant… “we have NEVER been so full!”. Early morning room service to get us up and about! Checking out and waiting for our rental car. 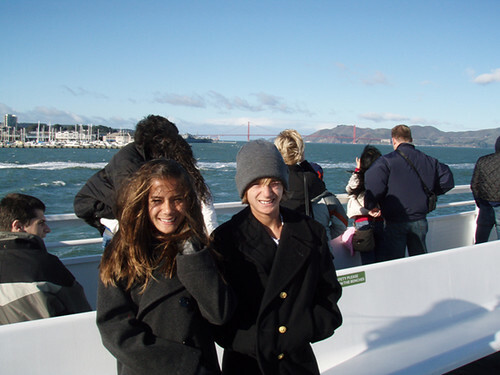 Windy and COLD boat out to Alcatraz (Golden Gate bridge in background). 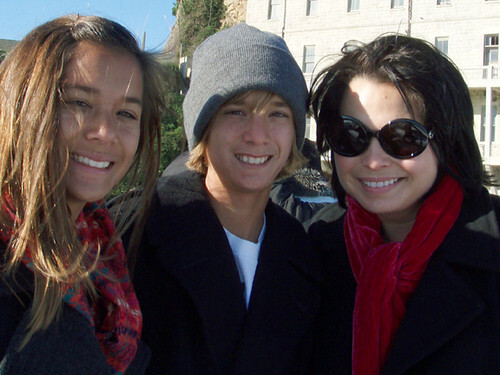 Kindal, Chace, Jo at Alcatraz. Waiting to catch the boat. A little snack at San Francisco Airport! Amazing Aunt for great twins! 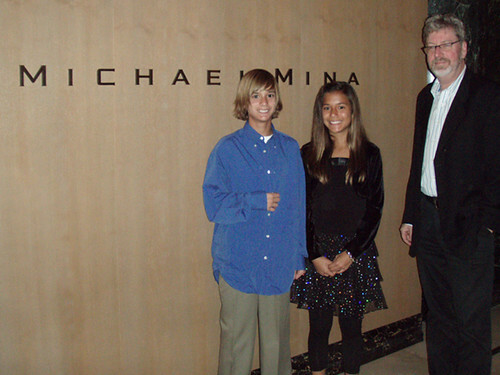 I’m glad Michael Mina worked out for you guys! Also, the twins are to be commended for trying everything; I don’t know if I would’ve at that age. What a great idea! At thirteen, kids are able to appreciate something like this, and it gets them excited about food and hopefully starts them on the path to becoming foodies. 🙂 You have got to be the coolest aunt ever. I am going to have to keep that in mind for my nieces and nephews. 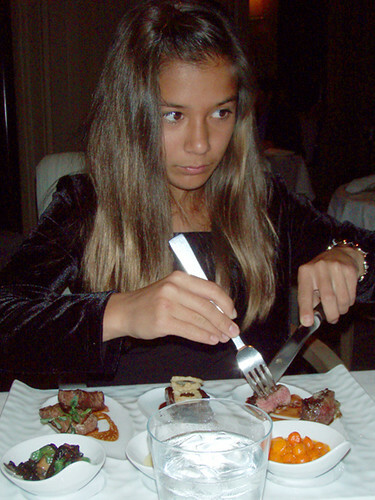 very cute trip, i hope my kids can eat that well when they are that age! Wow, I agree, you are incredible aunt! I know that one day, when I hear about twin chefs who are at the top of their field, I will know who they are! Thanks, but I think I’m the LUCKIEST Aunt ever! 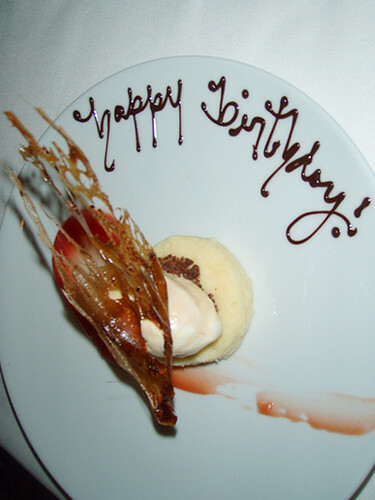 I would suggest Quince for your next SF trip – the food is among the best in the city. I wish my 13th (or any) birthday was like that!! I shouldn’t have read this right before lunch. 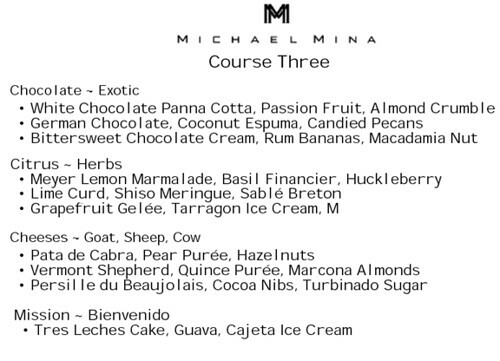 The Minas are wonderful people; and I hope a version of Michael’s extraordinary SF restaurant is up in heaven.